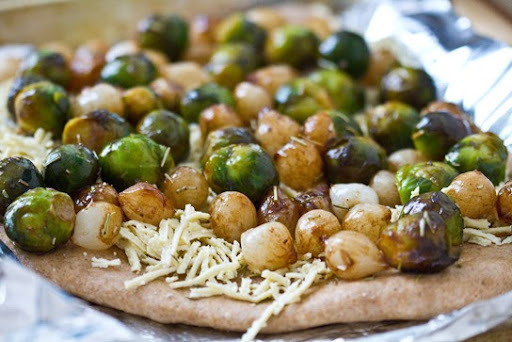 Balsamic Brussel Sprout, Pearl Onion Vegan Pizza. 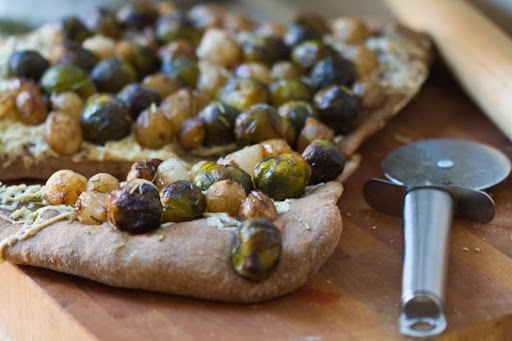 A few weeks ago I played around with vegan pizza and created this easy recipe: Balsamic Brussel Sprout and Pearl Onion Pizza. I loved it! 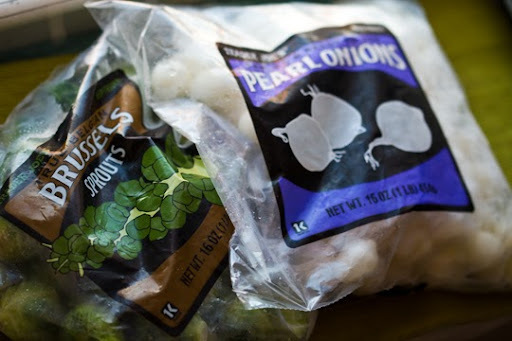 I was excited to try Trader Joe's new frozen True Belgium Brussel Sprouts and Pearl Onions. And ever since the Dole Summit where I was reminded about the nutritional joys (and flavor possibilities) of frozen fruits and veggies - I have been using them more and more of them in my easy go-to recipes. 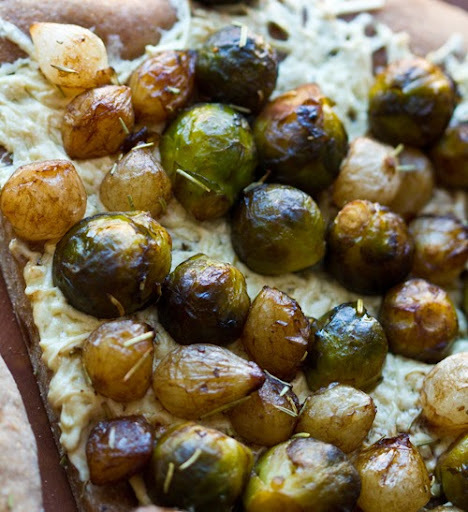 Frozen veggies don't have to be bland! Add the right flavorings and prepare them properly and you can achieve amazing textures and flavors that rival those of fresh produce. 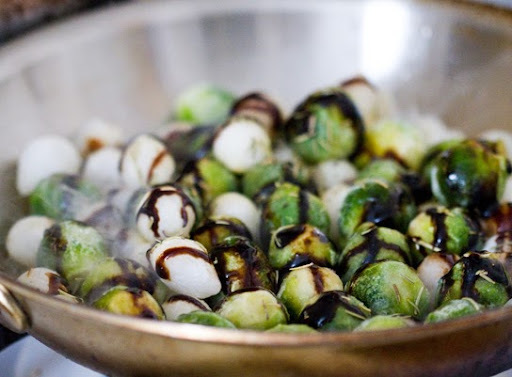 Nutrition: Super Foods Facts on Brussel Sprouts! If you want your frozen veggies to taste, well, good, never microwave them. You will likely end up with mushy or rubbery results. Try sauteing or roasting instead. 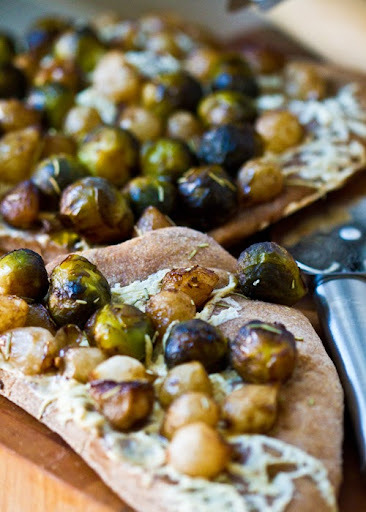 For this recipe, I first sauteed the veggies, them roasted them atop the pizza dough. Easy Vegan Pizza! So easy. I bought a fresh whole wheat pizza dough, and the veggie toppings at Trader Joe's. You can find fresh pizza dough at several supermarkets. Whole Foods also sells some in a delicious multi-grain flavor. The veggies were go-to because they are frozen. And then I added in some easy flavors like balsamic vinegar in the form of something called "balsamic cream" - yes it's vegan. It's a sticky, dense liquid you squeeze onto your ingredients. Look for it in the oil/vinegar section of your supermarket. It squeezes out in the texture of honey or a thin mustard. I also added in rosemary to infuse a crisp herb flavor into the crust. 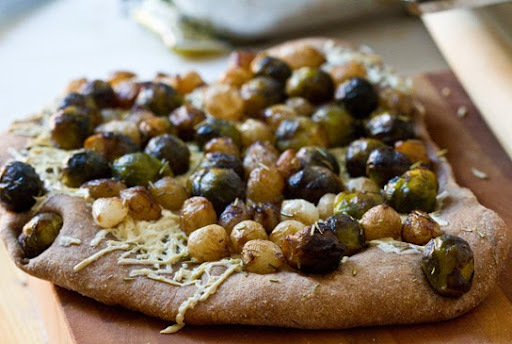 Brussel Sprouts on pizza were surprisingly satisfying. These were smaller than your average fresh American Brussel Sprout. So if you use fresh (large sized sprouts), just remember to halve or even quarter them to be the same size at the onions. Such a meaty texture makes this pizza quite hearty! 1. Preheat oven to 425 degrees. 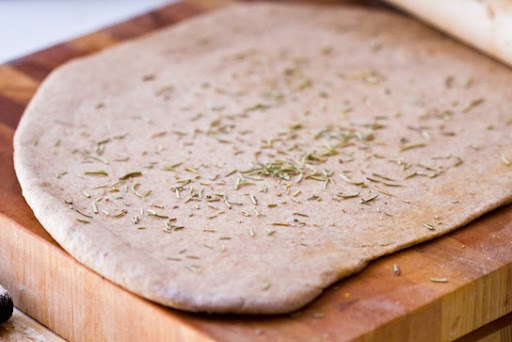 Shape your crust after rolling it out with a bit o flour and olive oil. 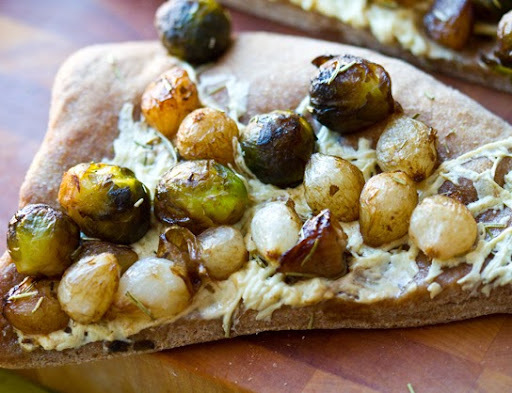 Brush olive oil over the top and sprinkle crushed rosemary over the crust. Any shape will do, it doesn't have to be a perfect circle pizza! 2. Heat olive oil in your saute pan. Add the veggies and balsamic cream. Saute until tender, but do not overcook since you will be roasting the veggies in the oven with the pizza. Add in some water or veggie broth during the saute if your pay gets too dry. But frozen veggies are usually quite moist. Add salt and pepper to taste. 3. Place your pizza on a pizza pan or baking pan. Sprinkle the cheese over the crust and place the sauteed balsamic veggies overtop as well. 4. Place you pizza in the oven and cook for about 20 minutes - or until the crust is cooked through and the cheese melted and starting to brown on the edges. 5. Remove from oven. Cool. Slice. Serve!